With the waters from Ganga and Sone rivers breaching embankments, 0.2 million people have reportedly lost their homes in flood-hit Bihar. The Army and the Air Force have been requested to stay on alert in case of any fatalities. The Ganga River has been flowing above danger mark in three districts—Patna, Bhagalpur and Buxar districts. River Sone in Bhojpur district, River Punpun in Patna, River Ghaghra in Siwan district, River Kosi at Baltara and Kursela in Katihar district are also flowing above danger mark. Bihar Chief Minister Nitish Kumar dispelled fear that swelling Ganga could flood the state capital, Patna. He said that there is no possibility of flood water entering residential areas. Meanwhile, five teams of National Disaster Response Force (NDRF) had been deployed in Patna on Sunday. 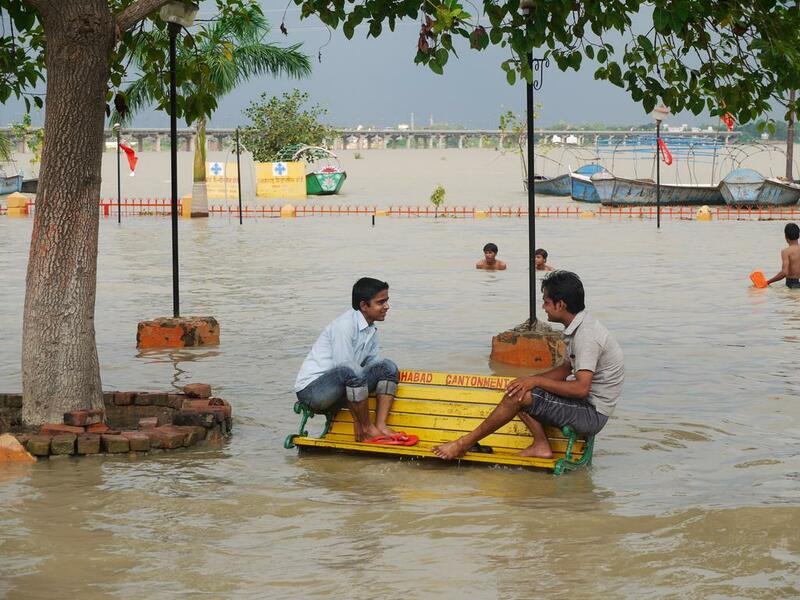 The flood situation is grim in eastern Uttar Pradesh with the rising level of water in River Ganga threatening places such as Allahabad and Varanasi. Over 100 villages are facing a critical flood situation in Allahabad with army being kept on standby for possible rescue and rehabilitation efforts. So far, about 10,000 people have taken shelter in relief camps. The Air Force at Gorakhpur has also been asked to stay on alert so that it can take the flood-affected people in riverine areas to safer places and drop food packets to the affected areas. Vigorous southwest monsoon for the last two days created flood-like situation in four districts of Rajasthan where six persons have been killed and over 70 people were airlifted. Incessant rain and overflowing rivers from Madhya Pradesh threatened lives of villagers in Chittorgarh, Udaipur, Baran, Pratapgarh, Banswara and Jhalawar districts. A maximum of 260 mm of rainfall has been recorded at the Jakham Dam in the Pratapgarh district. Places such as Nimbaheda, Badi Sadri and Bhadesar have received 220 mm of rainfall in the last 24 hours. In the southeastern districts of the state, several over bridges have been submerged in water, bringing road traffic to a halt. A total of 72 people have been airlifted since Saturday with 34 airlifted in Baran district on August 20 and 38 in Pratapgarh on August 21. Roads in Baran, Banswara, Chittorgarh, Darvywatt and Nimbahera have been inundated due to overflowing rivers. While isolated places in Udaipur division witnessed torrential rains, heavy to very heavy rain was recorded in Kota division.